Like tomato, carrot and other vegetable juices, celery juice is a convenient way to increase your daily vegetable consumption. It's not necessarily healthier than whole celery, but if you like the taste better than that of celery stalks, it could be the best choice for you. However, it's easy to over-consume juice and to fall prey to added sugars and other ingredients in commercially sold vegetable juice blends. Always read the label to get the whole story. One reason whole fruits and vegetables are recommended over their juice counterparts is that the whole foods contain fiber. Dietary fiber helps maintain a healthy digestive tract and prevents problems such as constipation, diverticulosis and hemorrhoids. Eating plenty of fiber also helps you feel full. Fiber is generally filtered out during the juicing process, so you're missing this key nutrient when you drink celery juice. Celery has very little sugar, making the juice a healthy alternative to soda and high-sugar juices. However, many juice manufacturers combine celery juice with other juices or even added sweeteners to make the finished product more palatable. If you want to drink plain celery juice, read the ingredients and nutrition facts label of the product you choose to ensure that not too much sugar has been added. You can also make celery juice yourself with a home juicer. One medium-sized stalk of celery has about six calories, less than 1 gram of sugar, no fat and about a 1/4 gram of protein. 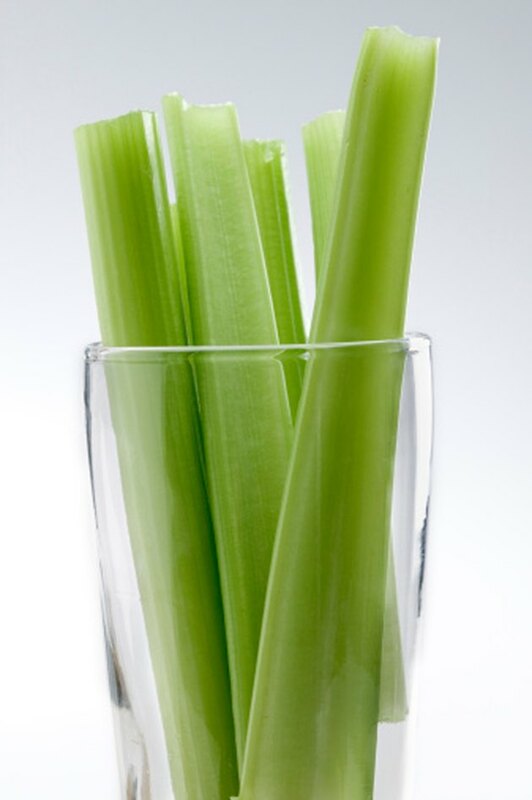 Half a cup of celery juice has 40 calories, 3 grams of sugar and 1 gram of protein. Although the serving sizes are not equivalent, you may find yourself drinking more juice than eating whole vegetables. If you choose juice over whole celery, keep your portion sizes in mind. Celery has over 100 milligrams per medium-sized stalk of of potassium, beta carotene, vitamin A and lutein. It also has small amounts of folate, vitamin C, magnesium and phosphorus. Celery juice's nutritional profile is likely similar, although small amounts of nutrients may be lost during the juicing and pasteurization processes.